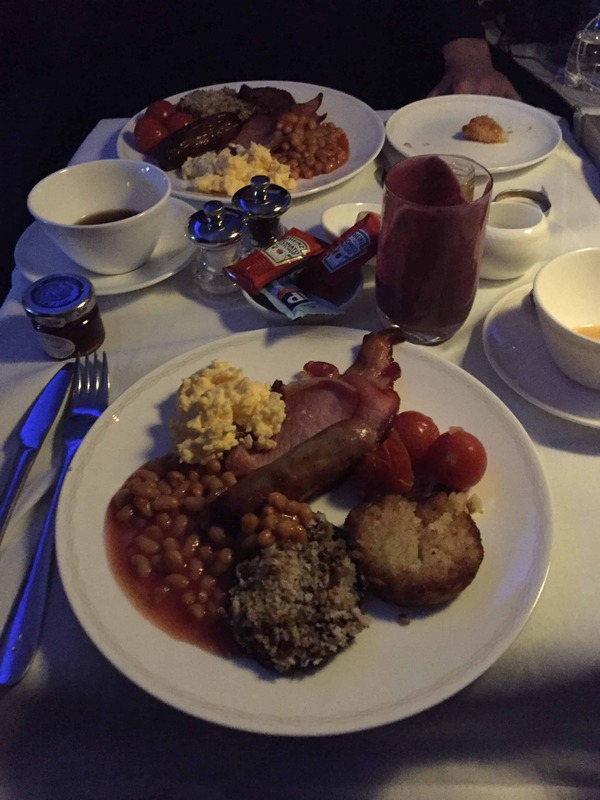 British Airways First Class Flight Review - Fly BA First Class for free! 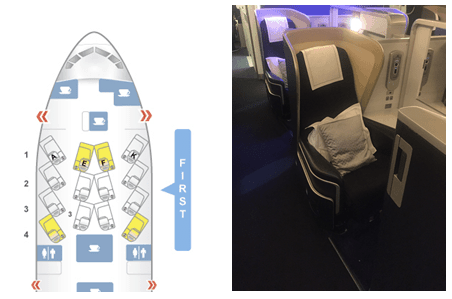 British Airways First Class Flight Review – Fly for free in 2018! Regular readers may know that I’m a keen (to put it lightly) Avios collector. I recently put these to good use, redeeming a British Airways First Class flight from London to Sao Paulo for both myself and my partner. Now I’m not the biggest spender and the thought of even being able to accumulate enough Avios for a First Class flight on British Airways may seem daunting to some. However, during this BA First Class Review 777 I hope to not only give you a full insight into my trip but also explain how you, too, can accumulate enough Avios points for a complimentary trip! I have to admit, Sao Paulo wasn’t the first place I wanted to visit (with Peru and Bolivia at the top of the list). 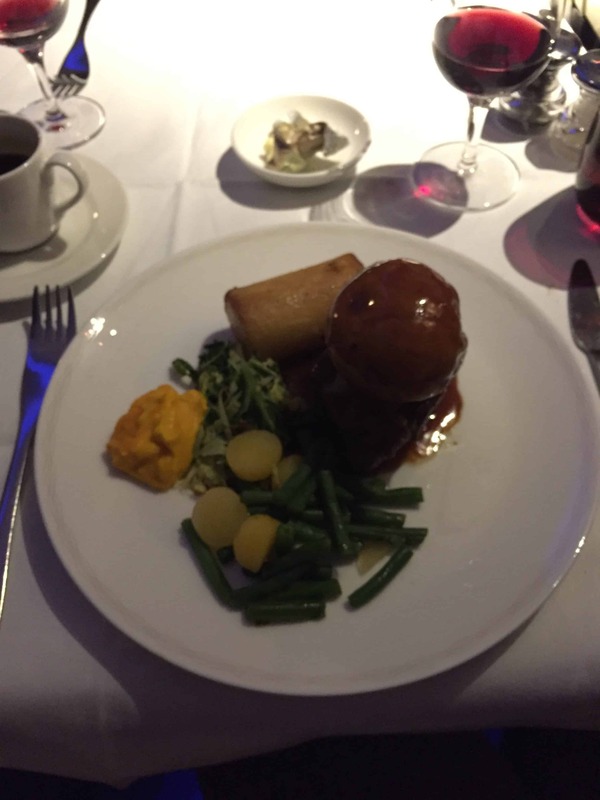 However with plenty of availability and an 11 hour 50 minute flight time, it allowed us to maximise the time spent enjoying the many luxuries of British Airways 1st Class. One thing that you should know is that not all First Class British Airways products are made equal. Whilst nearly all of the older planes have been refurbished, the difference between the Boeing 787 Dreamliner and Boeing 777 can be significant. Take a look below. This review is based around the British Airways 777 First Class product. American Express Gold Card: See my full review here. When you sign up to the card and spend £2,000 in the first 3 months you get a total of 20,000 points (22,000 if you use this link). These points can be transferred to either BA or Avios at a rate of 1:1. The card is free for the 12 months and you’ll also get 2 free lounge passes (plus additional perks). British Airways Premium Plus American Express: See my full review here. Again the BA premium card offers a good sign-up bonus of 25,000 points (or 26,000 if you use this link and scrolling down to the correct card). However the best thing about this card is that you get a 2-4-1 voucher, which means that both you and a companion can travel for the price of one. This reduced the total number of points we needed to collect to 100,000 (down from 200,000!). Note there is charge for this card of £195 per year. Alternatively there is a free BA card (reviewed here) which provides 5,000 Avios when you sign up and a 2-4-1 voucher at £20,000 spend, however I’d strongly recommend the premium version due to the lower spend threshold and the 26,000 Avios which offset the cost of the card. If you follow the step-by-step process below, you’ll see that it’s actually not quite as difficult to collect 100,000 Avios to redeem on that British Airways First Class flights as you may have initially thought. With recent changes to the American Express sign up bonus rules, make sure you sign up to the Gold card first – learn more about the sign up bonus restrictions and our suggested strategy here. Step One: Sign up to the American Express Gold card using this link for 22,000 Avios when you spend £2,000 in the first 3 months. Step Two: Persuade your companion to also sign up to an Amex Gold card using the link to receive a further 22,000 Avios points. Step Three: Sign up to the British Airways Premium Plus card using this link and scrolling down to the correct card to get 26,000 Avios (ordinarily you’d get 25,000 if you go straight to the website). Step Four: Spend £3,000 on the Premium Plus card in the first 3 months to collect 26,000 points and a further £7,000 to receive your 2-4-1 voucher. You can always add your companion on to the card to help you reach those spending limits! 80,000 Avios would get you a First Class flight to the likes of New York, Boston, Bermuda, Dubai or even Toronto. Take a look on the rewards redemption section of the BA website for alternative destinations. Use the British Airways Household Account to combine Avios points of the two travellers – full review here. Using the BA reward flight finder and our 2-4-1 voucher, we booked our British Airways 1st Class flight from London to Sao Paulo, with a return flight from Buenos Aires to London in economy. The total flight package used 140,000 Avios for the two tickets alongside the £365.97 per person taxes. The advertised price for the same British Airways First Class flight was £9,500 per person! One question that I’ve been asked before is whether there is a BA First Class dress code. Don’t worry, there’s no dress code! 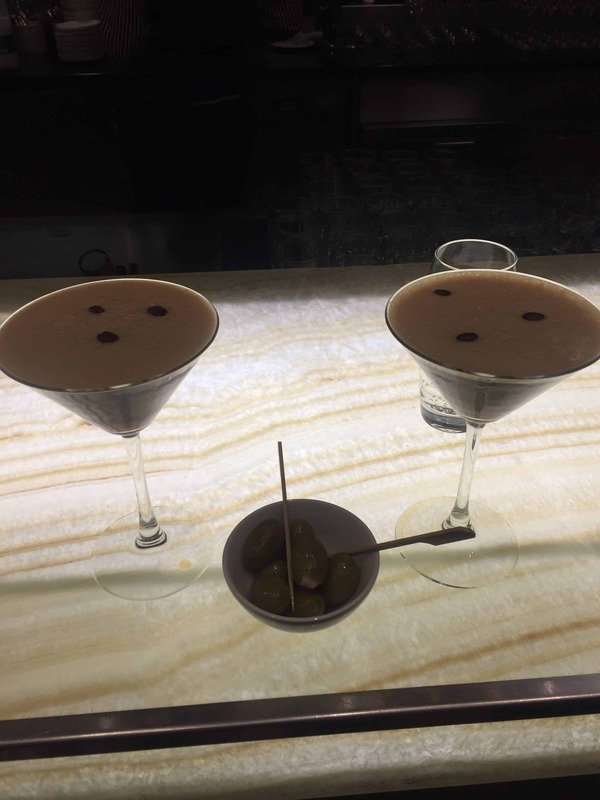 Now one last word of advice, if you’re flying from the UK, I’d strongly recommend flying from Heathrow T5 to have the opportunity to visit the Concorde lounge. 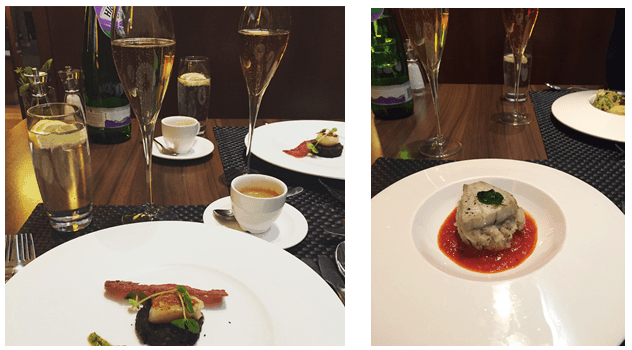 No other British Airways lounge comes close – read on to find out more! Another great benefit of flying from London Heathrow T5 is the dedicated BA First Class wing. As you walk through the golden gates, you quickly move from the chaotic departures terminal to the strangely tranquil BA First Class check-in area. We were booked on a 22.25 flight and got to the airport for around 6pm to make the most of the many services. Every time I’ve been through the Heathrow BA First Class wing, there has always been a free BA representative available to check me in, avoiding any possibility of queuing. 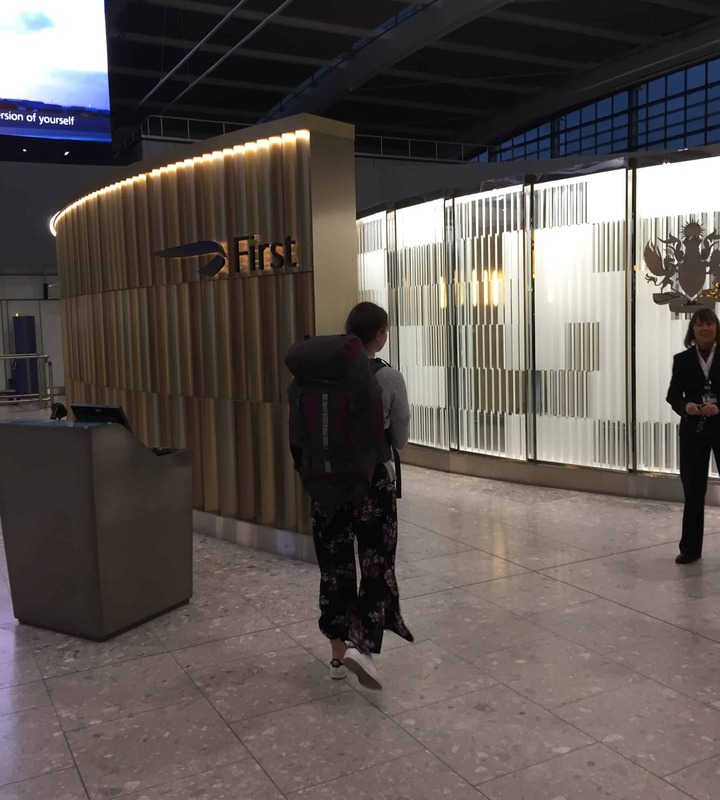 The First Class check-in area also benefits from a dedicated security area which will take you straight through to the First Class lounge – you can see my full review of the BA first class lounge here. 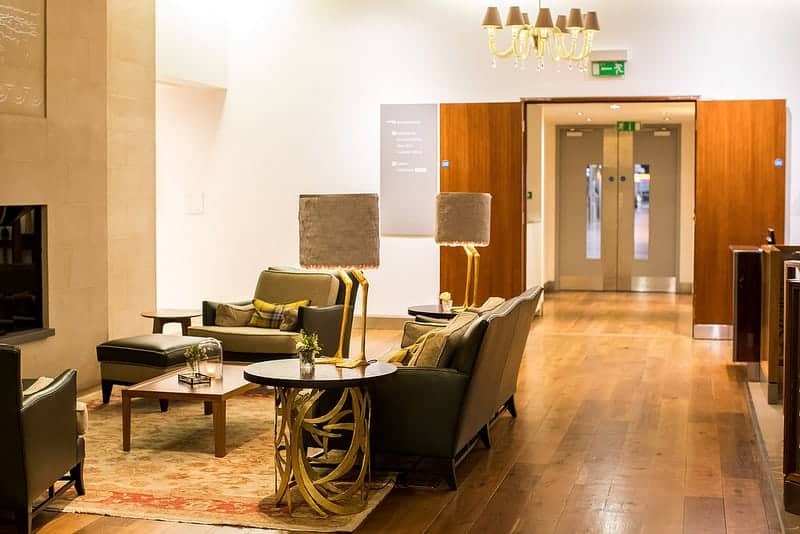 Now if you have a First Class ticket, I wouldn’t waste your time in the British Airways First Class lounge – head straight over to the Concorde lounge which is situated opposite. 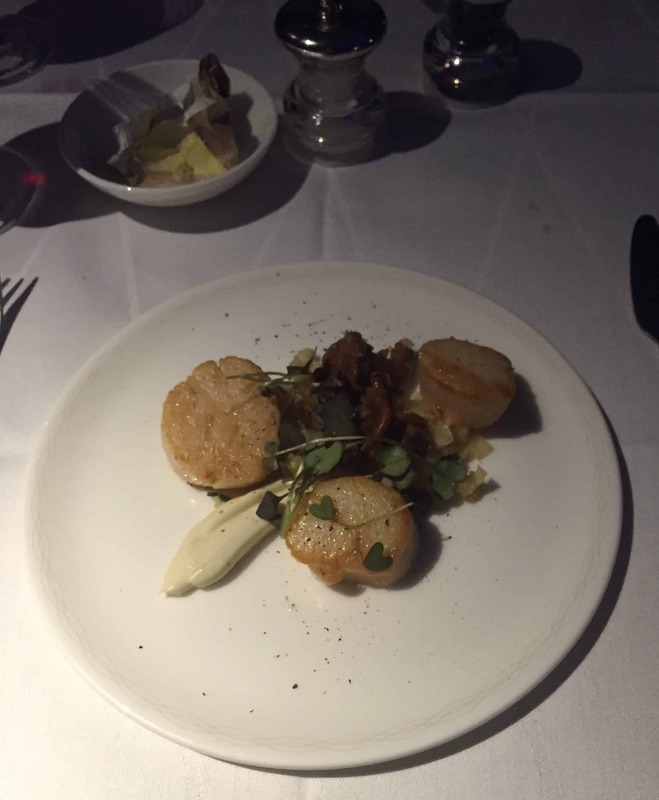 Hannah and I had come straight from work and as we knew we were going to be eating a three course meal on the plane we thought we’d try the a la carte restaurant straight away, leaving enough time for us to hopefully get hungry again before our next dinner! Dinner is served in private booths, with seating for a maximum of two. Champagne was free flowing from the minute we sat down. Hannah opted for the Laurent-Perrier Grand Siecle (she’s got expensive taste!) whilst I trialled the Henriot Rose NV. We thought we’d mix up the foods. To start, Pan-Seared scallops with black pudding and apple parfait for me. with Hannah going for Wild Mushrooms and chestnut puree tart. For mains, British Ox Cheek Bourguignon and Pan-Fried Coley. Both good choices! Following cheeses and coffees we made our way outside and sat in one of the cabanas. 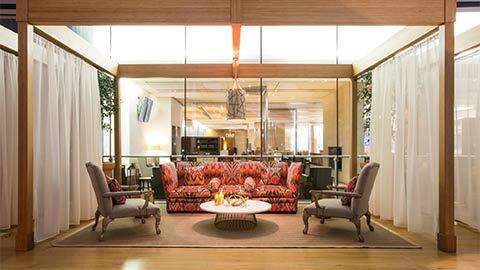 You can also book private cabanas which feature a private shower and bathroom, daybed, work table and television. First Class passengers are also able to book into the Elemis Spa in advance. Frustratingly the Elemis Spa was fully booked when we visited; make sure you book yourself in 28 days in advance! Before we knew it (and after one or two espresso martinis!) it was time to board the plane. After we finally boarded we were greeted with another glass of champagne and shown the way to our BA 777 First Class seats. When booking I used Seat Guru to take a look at the plane layout and decided that we would go for the centre seats in row 2. The 777-300 has a 1-2-1 layout providing a total of 14 seats (4 down the sides and three rows of 2 in the middle). The BA 777 First Class seats aren’t quite as new as the BA 787 Dreamliner, but are nevertheless large and comfortable. With 72 inches of pitch and 22 inches of width, these are significantly more comfortable than the equivalent Club World seat (70 inches pitch and 20 inches width). There are a number of little touches which make this an impressive First Class product. You’ll benefit from your own wardrobe, side table, bespoke lighting, power supply, etc. Unlike Emirates and Etihad there is no ‘at-seat’ mini-bar however the staff are more than attentive so this didn’t seem to matter. The large 23-inch screen is good, however the BA First Class media selection in comparison to some of the Middle Eastern carriers is somewhat poor. The IFE controller felt dated however as we were on a night flight and making the most of the first-rate food and beverage offering, this didn’t bother us too much. 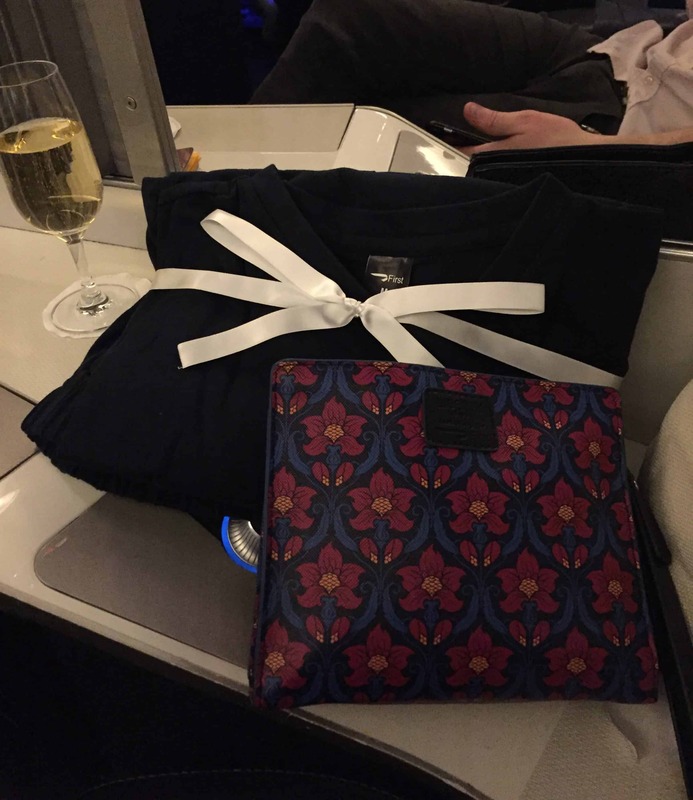 The BA First Class pyjamas went down very well with Hannah alongside his/hers Liberty’s wash bags. These include eye mask, ear plugs, lip balm, various moisturisers, shaving equipment, hairbrush, socks and a pen. The wash bag itself is actually very nice and a perfect size to keep for international business travel. Something I was slightly disappointed in was the bathroom. This was essentially the same as economy with Aromatherapy Associates hand wash and moisturiser, alongside flowers. Our plane didn’t offer Wi-Fi, which again wasn’t the end of the world for a night flight, however I’d be slightly disappointed if I was on business. When travelling First Class on British Airways, one of the best things is the selection of drinks and food. Throughout the experience we were offered Laurent-Perrier Grand Siecle which is about £110 per bottle. 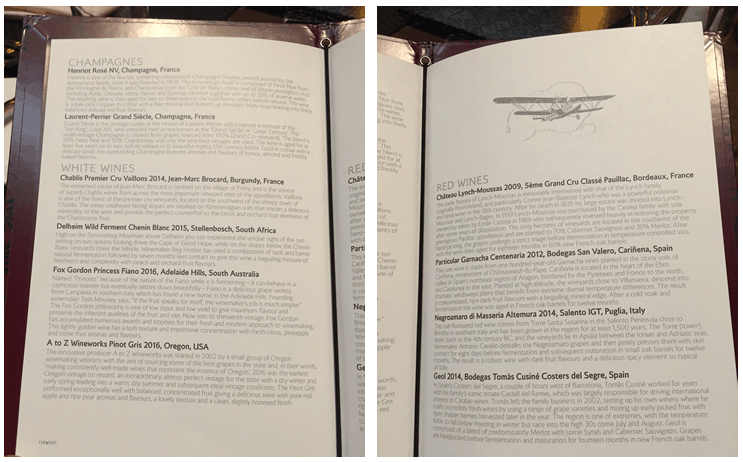 This compares to Dom Perignon 2006 offered by Emirates (roughly £130 per bottle) and Billecart-Salmon served by Etihad (a mere £40 per bottle). British Airways also offers sparkling British wine, Bolney Estate, which both Hannah and I sampled… not bad for an English sparkling wine! The remainder of the drinks selection is fine although not quite as luxurious as the champagnes. Unlike some providers, British Airways aircraft offer no on-board bar. Travelling as a couple meant that Hannah and I decided to dine together. We converted the foot stool into a seat, allowing us both to sit facing each other. The dining experience is definitely a step up from Business, with the table laid as if we were in a reasonable London restaurant. We were initially presented with an antipasti plate featuring Cumbrian air-dried ham, Cumberland salami, Berkswell cheese, olives and sun dried tomatoes. I went for the French onion soup and Hannah went for the scallops – both good choices. The pictures below don’t do the food justice I’m afraid. Again, lighting (and probably the fact we’d tested most wines on the menu!) resulted in the below pictures not doing the food justice. 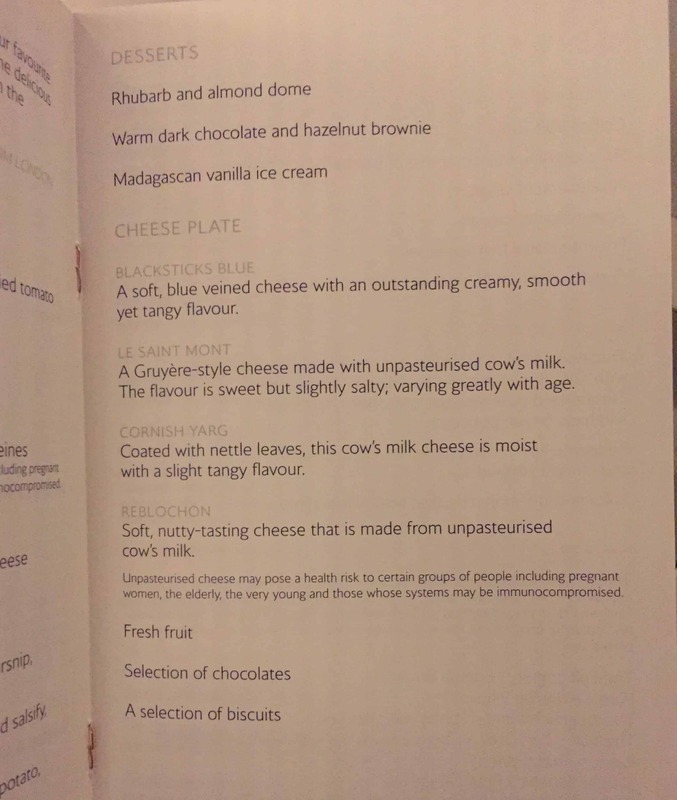 There were three options for dessert alongside various cheeses, although by now I felt like I’d eaten my fair share to say the least! By this point it was most certainly time for bed. While we changed into our BA First Class pyjamas the cabin crew very kindly made our beds for what was by far the best sleep I’ve had on an international flight. The next morning, following nearly 8 hours of uninterrupted sleep, we were woken by cabin crew for breakfast. Again we made the most of the food with fruit and smoothies followed by a full English breakfast. Before we knew it, we were preparing to land and as our First Class British Airways flight was coming to an end our adventure around South America was just about to begin! So was the Boeing 777 First Class BA flight worth the equivalent of 200,000 air miles? Completely and unequivocally yes! This was most definitely worth it. 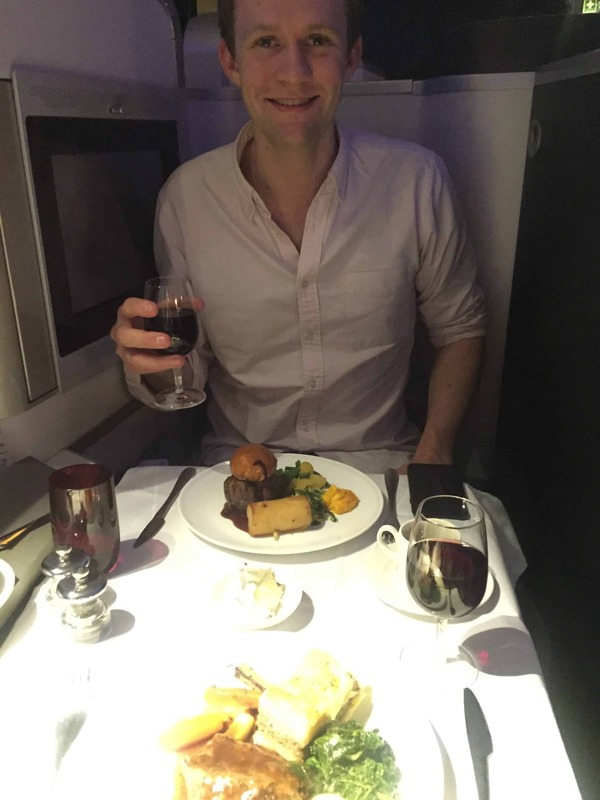 Travelling First Class on British Airways was an incredible experience for someone like me who is just an average Joe. Hopefully anyone reading this British Airways First Class review has gained an insight into the luxury world that upper-tier flying can offer. I’ll finish this review with a couple of final words of advice for anyone looking to book a British Airways 777 First Class flight. 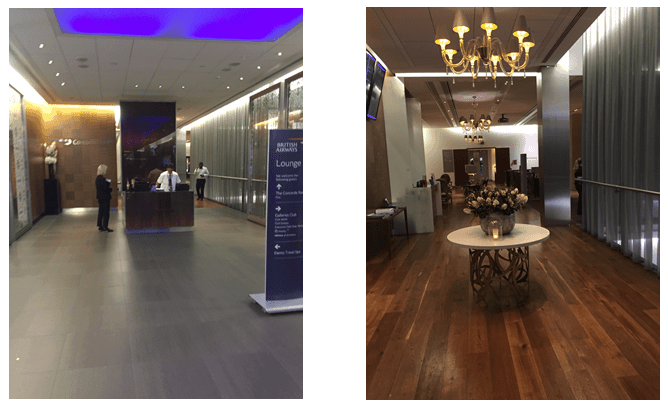 If possible try to fly from Heathrow to gain the benefit of the T5 BA First Class wing and access to the Concorde lounge – trust me when I say that none of the other UK lounges even come close! Book the Elemis Spa 28 days in advance to avoid disappointment. If you have the choice, perhaps try to fly the British Airways 787 Dreamliner which has a slightly better seat product than the slightly dated British Airways 777 First Class product. The in-flight entertainment is disappointingly average and the lack of Wi-Fi could either be the end of the world or a godsend depending on how you look at it. Make the most of the complimentary Laurent-Perrier Grand Siecle at £110 per bottle! Now just a final recap as to how you, too, could take this £9,500 per person flight for just £366 using Avios points. Sign up to the American Express Gold card using this link to get 22,000 Avios points when you spend £2,000 in the first 3 months. Persuade your companion you’ll also be travelling with to sign up to the Gold card. Sign up to the British Airways Premium Plus Amex card to get a further 26,000 Avios using this link (and scrolling down to the correct card) when you spend £3,000 (usually 25,000 without the link). Spend £10,000 on the card in 12 months to receive your 2-4-1 voucher. 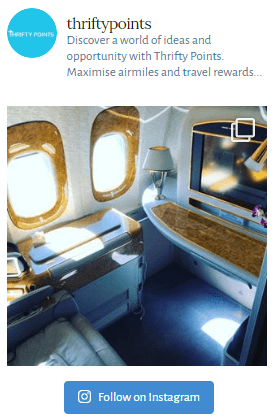 Use the 89,000 Avios points and 2-4-1 voucher to book the trip of a lifetime in British Airways First Class – check the BA website to see where you can go! As always I hope you’ve enjoyed this British Airways First Class flight review. Please do not hesitate to get in contact if you’ve got any questions.